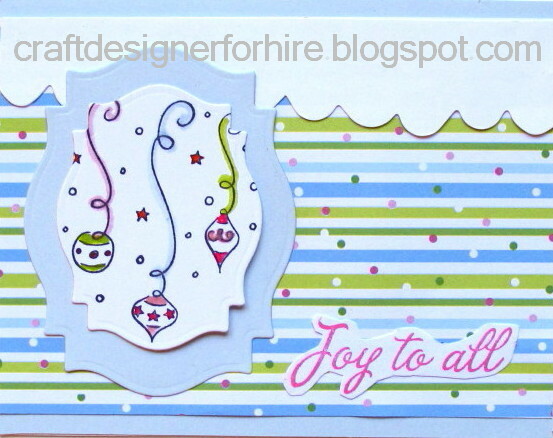 This Ornament Card is a great card to make if you are short on time. Below is the list of materials you’ll need to make this card. Plus the instructions on how to make this ornament card. Using the light blue cardstock, create a card base with the folded dimensions of 5 1/2″ X 4 1/4″. Use Labels Eighteen die on white and light blue cardstock. Use the scallops die on a strip of white cardstock. Cut a 5 1/2″ x 3 3/4″ rectangle from the decorative background paper. Stamp ornament stamp using black ink and sentiment using pink ink.